The year 2018 marks the seventieth anniversary of both the state of Israel and the United Nations’ Universal Declaration of Human Rights. Both remain tied together in the ongoing debates about the Israeli-Palestinian conflict, global anti-Semitism, and American foreign policy. Yet the surprising connections between Zionism and the origins of international human rights are completely unknown today. 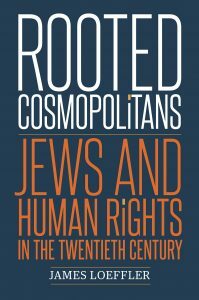 Drawing on his recent book, “Rooted Cosmopolitans: Jews and Human Rights in the Twentieth Century,” Professor James Loeffler will explain how and why Jews helped to build the modern human rights movement, and what this recovered history reveals about the future of both Jewish politics and international law. James Loeffler is Professor of History and the inaugural holder of the Berkowitz Endowed Chair in Jewish History at the University of Virginia. 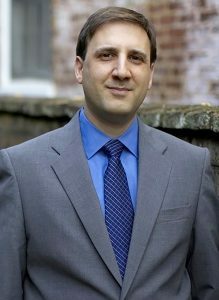 He is the author of “Rooted Cosmopolitans: Jews and Human Rights in the Twentieth Century” (2018) and “The Most Musical Nation: Jews and Culture in the Late Russian Empire” (2010), and co-editor of “The Law of Strangers: Jewish Lawyers and International Law in Historical Perspective” (2019). Professor Loeffler’s writing has also appeared in the New York Times, the Wall Street Journal, Slate, Mosaic, Tablet, and Haaretz.